Queen Eva was a stunning and kindhearted Queen. She was also the wife to King Leopold and the mother to Snow White. Queen Eva always believed that everyone deserved love and respect. She was certain to set these same traits into her daughter. She went as far as chastising young Snow White in front of a servant when Snow talked down to them. Out of nowhere, Queen Eva became very sick. Young Snow White was desperate to save her mother, and she sought out help from The Blue Fairy. The Blue Fairy gave her a magic candle that would trade the Queen’s life for another person. However, Snow White was just too good of a person to sacrifice another person’s life. She even told her mother about the candle. Queen Eva told her daughter on her deathbed how proud she was of her. She went on to say how they would always be together as long as Snow kept good in heart. After Queen Eva died, Cora appeared to speak with the Queen’s dead body. 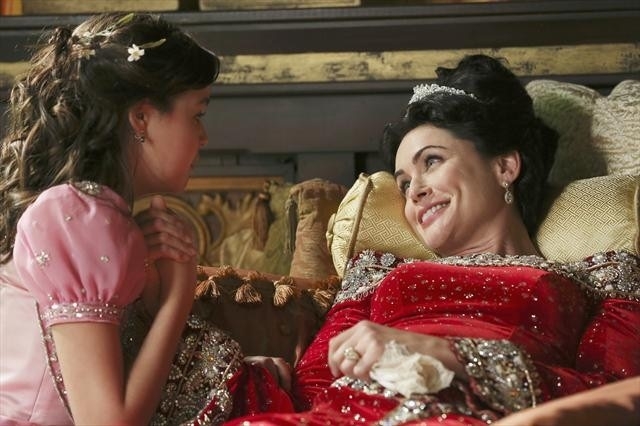 Cora revealed that she poisoned Queen Eva, so her daughter, Regina could become the Queen. Cora posed as The Blue Fairy, so she could try to darken Snow White’s heart. Rena Sofer played Queen Eva. Young Snow White is played by Bailee Madison.